Hi- A customer has an isolation damper tied to a relay on the VFD, so that when the VFD is started the relay will open the damper. When the damper endswitch is made, the signal goes back to the VFD to allow it to start. Set 5-40 relay 1 to  "Start Command Active". This works great for isolation dampers because the drive can open the damper with any start command or local hand operation. 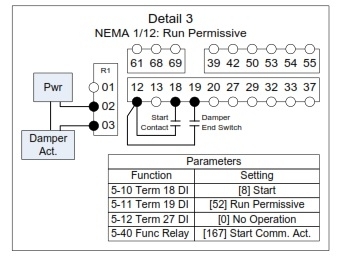 Set 5-11 Terminal 19 (or any open input) to  "run permissive". If you tie a damper endswitch to that input, the motor will not start until there is a contact closure across the input. Set 5-42 Relay 1 Off Delay ---Set this to a long enough time to allow the motor to completely wind down before damper closure--- it should be at least as long as ramp down time in parameter 3-42-- probably add another 30s or so on top of that and test it. As always call us if you have any questions!